Develop characters and plots – create a story out of your ideas. From the idea to the story, emotionally engage your audience by crafting your narratives, be it for novels, films, or any other media. Develop compelling characters and complex plots. Beemgee projects help editors and producers to evaluate and understand narrative story material – in a fraction of the time it takes to read a treatment, let alone a manuscript. Create and develop your characters: Find what drives them by defining their dramatic role in the story. Add conflict and tension to your narrative by determining their outer and inner motivations. Structure your plot: Note scene ideas on enriched plot event cards and organise your outline – as narrative and chronology. Prevent writer’s block: download a manuscript document that includes the synopses of all the individual scenes. Get contextual story development help when you need it. A huge resource of in-depth information and guidance is available from wherever you are in the tool, be it working on characters, plot, or pitch. The clear structure of the tool allows you the freedom to explore and harness your creativity. At the same time you will be discreetly learning the craft of dramaturgy – directly, and while developing your own story material. Share access to your story at any stage of development with a co-author, editor, producer, etc. Create PDFs of character sheets that provide deep understanding of the narrative by focusing on the inherent dramatic function of the character in the plot. Export the scene by scene Step Outline as the complete treatment, include core story information such as theme or central conflict, and head it with your logline. 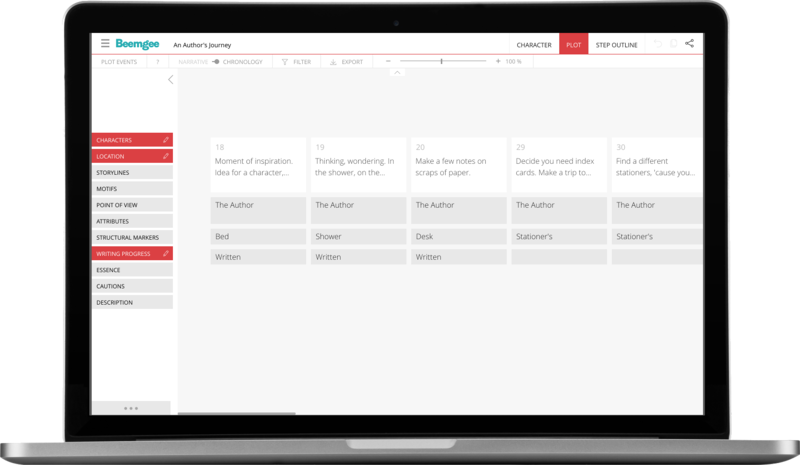 Join us in a quick walk-thru of our storytelling tool. It’s great! I’ve been recommending it to all my writer friends. It has changed the way I write and I’m accomplishing so much more now. Your software really does help me sink my teeth into my scripts and examine them forensically – almost at an atomic level and then build them up point by point, facet by facet. Beemgee helps you think deeply about the elements that go into a good story. There are tons of resources available to make sure you understand each story element and how it works in your story. If you’ve ever wanted a writing advisor giving you tips on the technical elements that go into creating a great story, Beemgee is your answer. Blogger, ghost writer, and content master. Author of "The Novel-Writing Training Plan". Beemgee has grown from a character development app to a fully fledged plotting tool. The internal logic of a story is magical, like the structure of a spiders web. Beemgee is a wonderful tool to explore and get to grips with this complexity. I was surprised how much Beemgee helped us sharpen the profiles of the characters in our game. The easy interface is great, the info tips behind the question marks make it possible for a novice storyteller like me to find out about the basics of storytelling technique. All in all, a very cool tool you’ve built there. Great for reminding you of the basics, and preventing you from getting bogged down in unimportant details. Beemgee really helps you figure out how your story can be dramatically powerful and make logical sense at the same time. Figuring out the plot is not my favourite part of writing. But you can’t write a story without a plot. Beemgee has helped me sort out my ideas and capture moments of inspiration, indeed to overcome writer’s block. It’s an aid to structuring my work, and is highly recommended even for pantsers, those authors who write by the seat of their pants. To professionalize your storytelling, sign up to PREMIUM. Click a box for details. Check out the features, live and in the pipeline, for FREE and for PREMIUM users. Click a box. Learn more about how stories work. Subscribe to our blog about plot structure and character development. More about our storytelling blog. Use the Beemgee storytelling tool free and develop your story idea today. Get to work preparing your next great narrative to make writing that much easier. Got a story in you? Give it form and structure with Beemgee’s story development tools. No download necessary.